WORLDWIDE: Corporate sourcing of renewables is becoming more prevalent, but a broader range of companies purchasing clean power and more stable policy frameworks are needed if the world is to meet the objectives set out in the Paris Agreement. 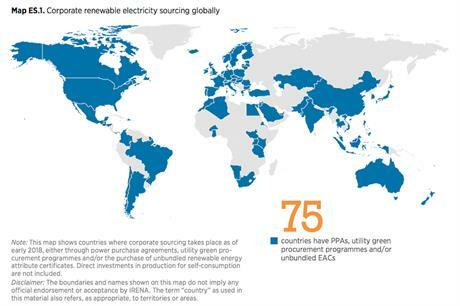 Companies in 75 countries worldwide actively sourced 465TWh of renewable energy in 2017, up from 265TWh the previous year, according to a new report from the International Renewable Energy Agency (Irena). 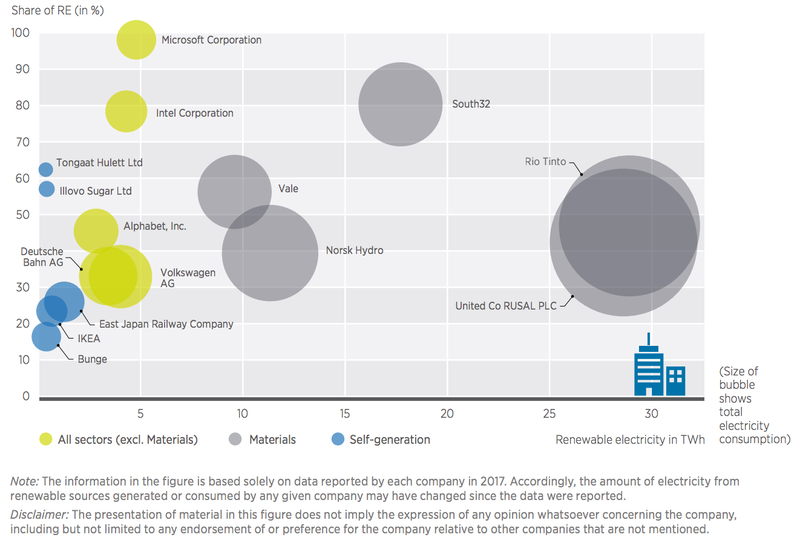 Demand for renewable energy came from corporations across a wide variety of sectors last year, the agency added in its Corporate Sourcing of Renewables report. But the current trajectory of corporate global demand for renewables is not sufficient to deliver on the less-than 2ºC-warming target in the Paris Agreement. "Corporations are responsible for around two-thirds of the world’s total final electricity demand, making them central to, and key actors in, the energy transformation," said Irena director general Adnan Z Amin. "As governments all over the world recognise this vast potential, the development of policies that foster and encourage corporate sourcing in the electricity sector and beyond will inject additional needed investment in renewable energy." Significant reductions in the cost of renewable energy technologies over the past decade have made clean energy sourcing a "mainstream pillar of business strategy" in recent years, Amin said. The cost of wind turbines and solar PV panels has fallen, strengthening the business case of corporate renewable sourcing, he added. Countries in Europe and North America continue to account for the bulk of corporate sourcing, Irena stated. But a growing number of power deals are being struck in the Asia-Pacific region and in Latin America. Few procurement deals have so far been stuck in African and Middle Eastern countries, however, but the region "promises high potential", the agency added. By volume, the material sector – which includes mining, chemicals, and pulp and paper companies – consumed the most renewable electricity (165TWh) last year. Meanwhile, the financial (24%) and information technology (12%) sectors consumed the highest shares. However, a broader range of companies of all sizes will need to raise their efforts to support renewable energy to enable the energy transformation, Irena concluded. Corporate renewable energy sourcing will also "need to go beyond the electricity sector and focus on all end-uses as well as energy efficiency measures", the report’s authors added. It is forecast that demand will grow from 465TWh in 2017 to at least 2,150TWh by 2030 and 3,800TWh by 2050. But this will only be enough to meet 20% of required renewable electricity demand in the commercial and industrial (C&I) sector – which today accounts for about two-thirds of the world’s end-use of electricity – by mid-century. The necessary corporate demand to keep pace with the Paris Agreement’s objectives can "drive investment in renewables and accelerate the global energy transformation", the authors wrote. But more countries will need long-term, stable and predictable policy frameworks to ensure that rising demand is translated into additional installed capacity, the report concluded.